It was in all likelihood the bishop Saint Loup who had the area's first cathedral built in the 5th century, in the southeast corner of the castrum (fort). It was nearly totally destroyed in 890 when the Normans torched Troyes. At the end of the 10th century, after a long and troubled period, Milon, the 44th bishop of Troyes, rebuilt the cathedral in the Roman style. But in 1188, another fire ravaged a large part of the city and the cathedral, the remains of which are now located under the present one, was also seriously damaged. 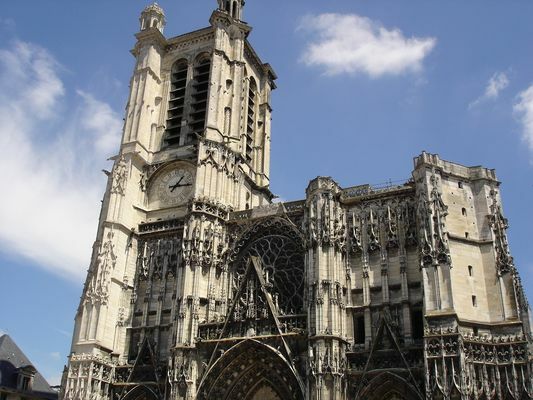 An era of Christian fervour and technical innovation launched Gothic art in France in the 12th century. 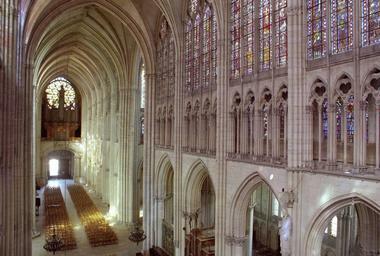 Starting in 1198, the bishops Garnier de Trainel and then Hervée (represented in a 13th century stained glass window in the choir) undertook the construction of one of the grandest and most beautiful cathedrals in France, beginning with the apse's chapels, on the site of the former Gallo-Roman ramparts. The transept was built in 1260 and the first spans of the nave were installed starting in 1310, but the project was interrupted by the Hundred Years War (1337-1453). In the 16th century, the final spans were placed in the old church. The west façade, a masterpiece by Martin Chambiges, a master mason from Paris, was finished in 1554, along with the base of the Saint-Pierre tower, which was not completed until 1634. During the construction, eight loggias were built along the building's wall for use by labourers and stonemasons. They were replaced in the 19th century by stalls where bread was sold. The Saint-Paul tower was never built because of a crisis in the Christian faith and a shortage of financing. 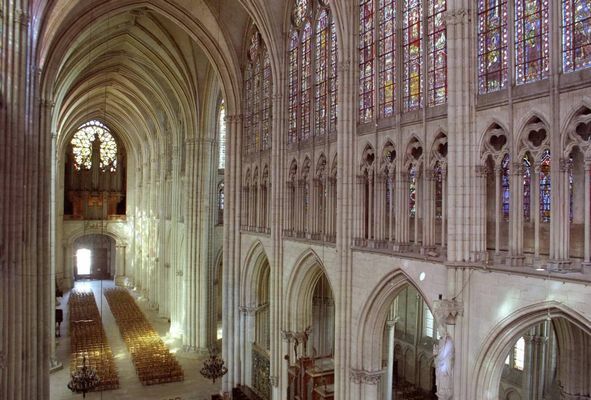 Erected over a period of more than 400 years, the cathedral illustrates the various stages of the Gothic styles : Pure, Rayonnant and Flamboyant. But the ensemble is very homogenous and admirable both inside and out. At 114 metres long and 28.5 meters high, it is one of the most famous in France owing to its elegance, the quality of its sculptures, its paintings, tapestries and especially its stained-glass windows (1,500 m²). In the choir, the 13th century stained-glass windows represent Mary, Saint John, various episodes from the Bible and figures from the Middle Ages. In the nave, the Tree of Jesse (circa 1500), the Mystic Wine Press (1625) by Linard Gonthier and other leading works by this famous master stained-glass artist from Troyes (1565-1642) are on display. The sculpted wooden stalls of the choir (18th century) are from the Clairvaux abbey, as are the famous large organs (18th century). 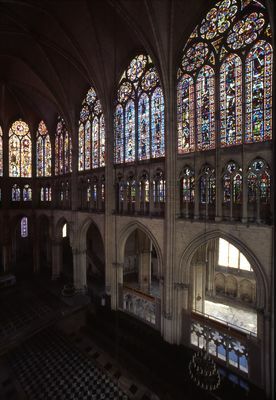 The Cathedral of Saint-Pierre-et-Saint-Paul in Troyes has a reputation for housing one of the most stunning collections of stained glass windows in France, with more than 1,500 sq. m of painted glasswork (the equivalent of approximately six tennis courts). Yet it is also home to another jewel: its treasure collection. According to experts, it is one of the three or four most important treasures in France. The collection’s gems include a Byzantine purple ivory box dating from the 11th century. It was one of the objects looted from Constantinople during the Crusades in 1204. As well as a stunning collection of medieval enamel pieces, the treasure trove also features another gem: the shrine of Saint Bernard, including relics (his skull and a femur) of the spiritual father of the Knights Templar. Pilgrims come from across Europe to pray and reflect in front of the bones of the founder of Clairvaux Abbey. Other preciously conserved items include the chalice, crosier and pastoral ring of Monseigneur Hervée, the founding bishop of the cathedral. In 2014, the cathedral’s treasure collection was moved to a new setting, following two years of work. It is now more accessible and better presented than previously, housed in a lowvaulted room to the right of the choir. It features 160 sacred objects from the total collection of 260 pieces, and recounts the turbulent history of the treasure trove. The collection is the result of the looting of churches and palaces in what is now Istanbul, when the city was ransacked during the Fourth Crusade. The treasure was duly abused during the Revolution, with the revolutionary forces helping themselves to some 800 kilos of gold from the collection. In the 19th century, the treasure was restored via several gifts, and the addition of liturgical furniture discovered in the tombs that were exhumed during a series of archaeological digs inside the building. The changing faces of the treasure reflect the tumultuous history of a cathedral that has been built and rebuilt, suspended and resumed, damaged and repaired on numerous occasions. The cathedral was built over several centuries, and was never fully completed. You can see this for yourself if you visit in person. In fact, the cathedral is missing an entire tower (the Saint-Paul or south tower), which was never completed due to a lack of money. It could be described as a one-eyed or one-armed cathedral – depending on your preference – that has been passed down the generations to us, today. Yet this “disability” is also what makes the cathedral both charming and unique. This vast stone edifice has survived the ravages of time through a relentless series of restoration campaigns. Recently, for example, work was undertaken to restore the western façade of the building to its former glory. The Cathedral of Saint-Pierre-et-Saint-Paul remains an incontestable masterpiece of Gothic art. as indicated on a plaque at the foot of the tower. 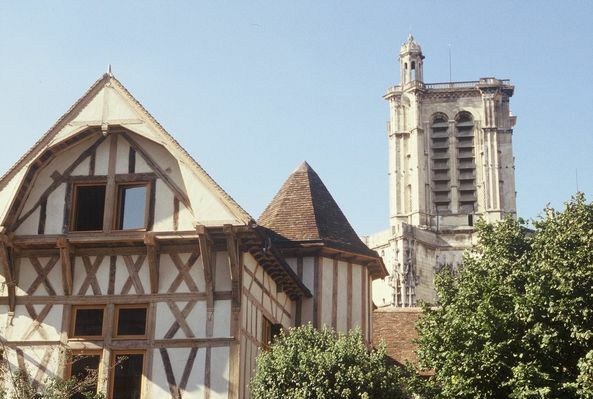 From this same place in 1536, Denis Bolori, a Troyes watchmaker of Italian origin, jumped off the tower in an attempt to fly, wearing a set of articulated wings, which held him aloft for several minutes, before crashing 1 km further eastward, at Saint-Parres-aux-Tertres. An unsung pioneer of aeronautics !